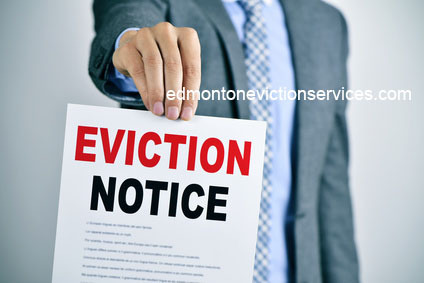 Saskatchewan, Sherwood Park or other cities in Alberta, Canada you would know that eviction is an important remedy for tenants who do not pay rent. You put your commercial or residential property up for rent so that you can have a viable business and a steady income but once you signed an agreement with tenants who do not honor their words, be it written or spoken, you have recourse. If you have encountered such tenants you will agree that evicting them is the only way you can regain a bit of control and sanity. As a landlord, you have the option of preparing a common 14-day eviction notice to be given to your problematic tenant. This notice is a formal way of informing your tenant that he or she needs to pay the amount he or she owes you and then move out on or before a specified date. Unfortunately, sending formal messages such as this is the least effective among all the options to evict. Just like a simple note, your tenant can just ignore it and go on with his troublesome ways. After the period specified in the notice and you still did not receive the payment, you have no choice but to go through the formal eviction process. You have no authority to drive out your tenant even though he did not abide by your formal notice. Landlords are not aware that they can actually skip the process of sending notice explained above and go through the Residential Tenancy Dispute Resolution Service (RTDRS) immediately. In fact, this will save you time and money since you don’t need to wait for the notice to be ignored before taking a more legal approach. At the end of the day you need some kind of legal authority to actually evict your problematic tenant effectively and RTDRS is the best way to do this. It is important to point out, however, that this process is time consuming and require certain expertise to pull off in an effective manner. There are a lot of professionals who offer services that will aid you to evict your tenants on your stead. This option is probably the most expensive compared to the other options above but hiring professionals will prove to be the most advantageous of all. For one, it is the most convenient since you will hardly do anything after giving them all the information they need. Secondly, it will relieve you of the stress and anxiety of dealing with your tenants. And lastly, you can be assured that they can carry out RTDRS much better than you can. Out of the different options above it is important that you consider what would be most beneficial in your situation. While you can save a few dollars doing things your way, you need to take into account your experience and exposure in doing this process. At the end of the day, keep in mind that you can never quantify the value of lost time and lack of sleep.